Photo: FC Barcelona’s Lionel Messi, left, gestures next to his coach Ernesto Valverde during the Spanish La Liga soccer match between FC Barcelona and Valencia at the Camp Nou stadium in Barcelona, Spain, Saturday, Feb. 2, 2019. Barcelona, Feb 7 : Leaning forward in his winter coat, Lionel Messi fidgeted with an empty water bottle as he watched his Barcelona teammates trailing their fiercest rivals. But minutes before he decided to test his tender right leg, the chants at Camp Nou for “Messi! Messi!” turned into cheers as a little-used teammate scored an equalizer against Real Madrid. Malcom’s second-half goal left their Copa del Rey semifinal poised 1-1 after the first leg, with Madrid going home with a slight away-goal edge for the return game later this month. 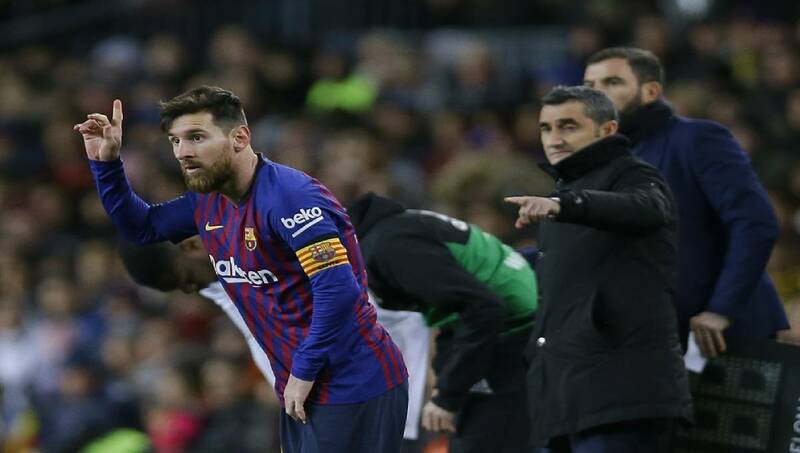 Having picked up a right leg injury after scoring twice in a 2-2 draw with Valencia in league on Saturday, Messi stayed on the bench until the 64th minute. The Argentine then came on and didn’t show any signs of an injury when he plucked the ball from Casemiro’s boot, raced forward and was fouled by a scrum of Madrid’s defenders near the area. He stayed on the turf to gather himself, before he smashed his free kick into the wall. But other than an opening goal by Madrid forward Lucas Vazquez and Malcom’s equalizer, this “clasico” was more of a clunker. It was the first of three matches between Spain’s most successful clubs in less than a month. The second leg of the semifinal in Madrid is on Feb. 27, just before their Spanish league game at Santiago Bernabeu Stadium on March 3. In October, Messi missed Barcelona’s 5-1 rout of Madrid in the league, a stinging loss that sealed the fate of former coach Julen Lopetegui. This time out, Madrid made sure to set a strong tone from the opening, when it maintained possession long enough to get in front. The highlight duel was between Barcelona right back Nelson Semedo, who got the most of Madrid youngest Vinicius Junior with more than one skillfully dribble. But the 18-year-old Vinicius did provide the key pass to the visitors’ goal in the sixth minute when he spotted Karim Benzema at the far post defended by the under-sized Jordi Alba. Benzema won the ball after Alba failed to reel it in, and the Madrid striker sent a low pass across the goalmouth where Vazquez slipped around Clement Lenglet to redirect it home. As Madrid sat back to protect the advantage, Barcelona began to find holes in its defense. Ivan Rakitic headed Malcom’s free kick off the crossbar in the 32nd, and Suarez drew a one-handed save from goalkeeper Keylor Navas after Malcom bungled his way through three defenders before setting him up on the edge of the box. Malcom pulled the hosts level in the 58th when he curled a left-foot strike from an angle into the net with Navas off his line. Lenglet’s long pass to Alba streaking into space forced Navas off his line to strip the ball, but it fell to Suarez who hit the post before Malcom gathered the rebound in and finished it off. It was the 21-year-old’s third goal since joining Barcelona in the offseason from Bordeaux.